He may not be the most well known of directors, but he left his mark. He gave Porky his bow tie. 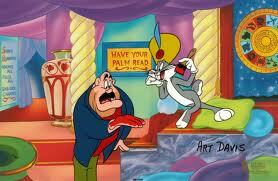 Here’s another entry on the list of The one hundred greatest Looney Tunes. The last national bank is robbed one night. (Not in the traditional “This is a stick-up” sense. This had some thought put into it) The criminal blows up the vault and makes off. The police have identified this villain as Slug McSlug. (Who is not actually a slug) He’s not too bad of a mastermind either, seeing as he paints his Sedan just after the cops identify its color. (I’m guessing they couldn’t get his license plate number.) Driving away from it all, McSlug hides out in a cabin. (I don’t know if it’s his or not, but is that really the question here?) He covered his tracks well, but the cops still pull up right outside. But they’re not stopping. They are just dropping somebody off. Daffy to be precise. What McSlug doesn’t lack in brains, he makes up for with his lousy shooting. He can’t hit the constantly moving towards him target. (Daffy mistakes the bullets for mosquitoes) When he finally reaches the door, we find out that he’s merely a (stupor) salesman. And he’s not taking “not interested” for an answer. He demonstrates some of his wares: gun polish that makes McSlug’s gun so shiny it melts, a mini helicopter that breaks through the roof, and an elevator that crashes through the floor. Daffy refuses to leave until Slug buys something. Surely there must be something he wants/needs? Well, he could do with some brass knuckles. Daffy has those. (What hasn’t he got?) Slug tries to test them, but they break upon the iron Daffy holds to protect himself. Slug tries firing his gun at him again, but quickly runs out of bullets. 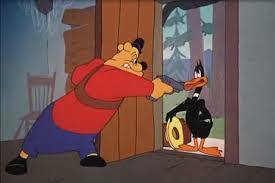 Being the stand-up guy he is, Daffy offers him a free sample of bullets. When fired at again, it’s revealed that he was also demonstrating his bullet proof vest. He also has a lighter that he wants to show off. He turns on the oven and attempts to demonstrate. The darn thing doesn’t seem to work and if that wasn’t enough, Slug loses his patience and tosses the duck out. Once alone, he tries the lighter himself. (What compels him to do that? Does he just want to prove he can make it work? Did he actually need a lighter? Does he have some weird kind of fire fetish that he can’t indulge in until he’s alone?) But the oven has been on the whole time and the cabin is full of flammable gas. He gets it to work just as Daffy is coming back for another round. He’s finally got something to sell that Slug needs. A house to go with his remaining doorknob. 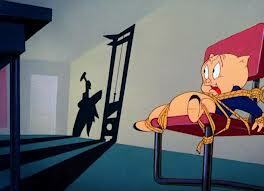 This is one of my favorite Porky cartoons. Is it popular? Not to my knowledge. Is it one of the best? No. Is it funny? Heck yeah it is! One of the reasons it’s so great is because Porky is a jerk in it. Hes a lumberjack who is trying to chop down a tree that a squirrel in it. The squirrel asks Porky to stop (since he’s on vacation) but Porky refuses and declares all out war. The squirrel is funny but he has no name. So i need a name for him. Any ideas?